- In Champagne the commander of the French XVI Corps reports to General de Langle that his force has made a small 'crack' in the German line, but that efforts to enlarge the breach have been thwarted by murderous flanking fire. De Langle's response is to alter the direction of the assaults and order their continuation. - After several hours of artillery preparation and the detonation of several mines, French infantry assault German positions held by XVI Corps today on the Bolante Plateau and west of Boureuilles in the Argonne. - Though the fighting continues in Champagne, Joffre is already looking forward to future operations. Near the German border is the French Provisional Army of the East, which includes 1st and 3rd Armys and Army Detachments Vosges and Lorraine, and is commanded by General Auguste Dubail. Today Joffre instructs Dubail to commence preparations for an offensive against both flanks of the St. Mihiel salient, for which he will provide three corps and a cavalry division as reinforcements. - In the central Carpathians all available reserves of the Austro-Hungarian 2nd Army are rushed to prop up the reeling XIX Corps and prevent a Russian breakthrough. With nothing left to send to the aid of the corps advancing on Baligrod, 2nd Army commander calls off the offensive. Over the past fourteen days, 2nd Army has lost 33% of its strength, numbering 51 086 men. Even Conrad now acknowledges that his winter offensives to relieve Przemysl have failed, and that the garrison cannot be relieved before it is starved into surrender. This, of course, does not deter Conrad from planning further offensives in the Carpathians, as he informs Falkenhayn today. - In the early morning hours a determined effort is made to sweep the minefields in the Dardanelles. First the pre-dreadnought Cornwallis enters the straits and bombards the searchlights and mobile batteries, followed by the light cruiser Amethyst and four destroyers at 2am. An hour later, seven trawlers, with crews that now included naval volunteers, enter the Dardanelles, intending to sail in, turn, and sweep on their way out. Despite the ongoing shore bombardment, they are quickly illuminated by Ottoman searchlights, and by the time they reach the point to turn and begin sweeping, they are under intense fire. Two trawlers had their sweeping gear blown away, a third had its captain and deck crew all killed, and two more collided and drifted down the straits, entangled and seemingly the target of every Ottoman gun in range. The two remaining trawlers manage to sweep several mines, but it is a meagre return, especially considering that Amethyst takes a large shell to its mess deck, killing twenty-four and injuring thirty-six. Assessing the results in the daylight hours, Admiral Carden concludes that the only way for the minesweeping operation to succeed is if a smothering naval bombardment can first obliterate the Ottoman guns. To do this requires the fleet to sail into the Dardanelles in daylight, and planning begins for such an attack in four days' time. - At 5pm the two zambuks carrying Emden's landing party departs from Yabana, just north of Hodeida, with both ships flying the German naval pennant. Aware that a blockade line to the north is maintained by several English gunboats, First Officer Mücke orders the zambuks to part ways, to avoid both being captured together. - At dawn this morning, the armoured cruiser Kent and the light cruiser Glasgow round Cumberland Point on Más á Tierra. Before them is the German light cruiser Dresden, at anchor and still waiting for its collier. When Dresden trains its guns on the British warships, Glasgow opens fire. Within four minutes, having already been struck at its waterline, the Germans raise the white flag. A steam launch departs Dresden carrying Lieutenant William Canaris (yes, that Canaris) to register a complaint to the captain of Glasgow that the German warship was in Chilean waters and thus under Chilean protection. The response of Glasgow's captain is, in the finest traditions of the service, that unless Dresden surrenders immediately, he will blow it out of the water, neutrality be damned. The German response is to scuttle their ship and escape to shore, singing the German anthem as Dresden keels over. Thus sinks the last survivor of the German East Asiatic Squadron, and it is fitting that Glasgow, who escaped from the squadron's greatest triumph, is present at its final demise. 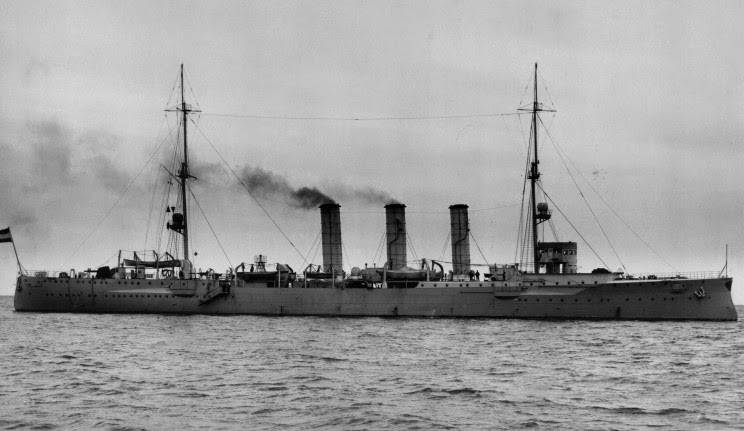 The German light cruiser Dresden, scuttled today at Más á Tierra.